Three schoolgirls, immaculate in white tights and ribbons, sit rapt, listening to Father Michael in the shade of a spreading tree. They come from the nearby village, high in the mountains, where cabbages and roses bloom in back yards, sheep’s fleece is spread out to dry in the sun, while chickens and pigs rootle in the lanes. The village is Tatev, and the ninth-century Tatev monastery within whose fortified walls this small group is sitting, was once a great centre of learning, home to a thousand souls. Below the monastery, the Vorotan ravine plunges 1,000 feet into wooded depths. To reach it by car, we had snaked round the mountains for an hour, descending to cross Satan’s Bridge before rising again to Tatev, and to a sense of peace that you might imagine has persisted for the past 11 centuries. But telltale cables above our heads herald a new dawn. Earlier this month, the world’s longest cable car opened here, linking Tatev with Halidzor village in the valley below. 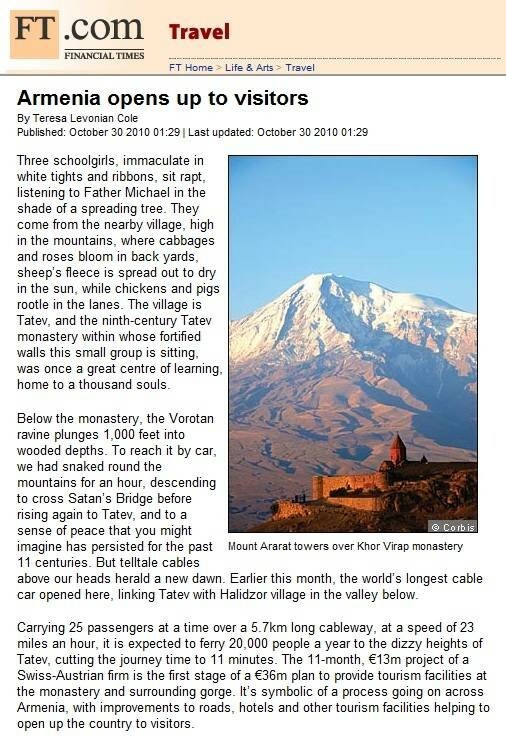 Carrying 25 passengers at a time over a 5.7km long cableway, at a speed of 23 miles an hour, it is expected to ferry 20,000 people a year to the dizzy heights of Tatev, cutting the journey time to 11 minutes. The 11-month, €13m project of a Swiss-Austrian firm is the first stage of a €36m plan to provide tourism facilities at the monastery and surrounding gorge. It’s symbolic of a process going on across Armenia, with improvements to roads, hotels and other tourism facilities helping to open up the country to visitors. This small former Soviet republic squeezed into the highlands between Turkey and Azerbaijan, Georgia and Iran, once extended across Asia Minor to the Caspian Sea. In 301, it became the first nation in the world formally to adopt Christianity, and, 100 years later St Mesrop Mashtots invented his spikily impenetrable alphabet of 36 “warrior” letters – on which Lord Byron was to sharpen his wits at the Armenian Monastery in Venice – to translate the Bible. Against a history of invading Persians, Byzantines, Arabs and Turks, and periodic pogroms, not least the genocide of 1915 attested to by a memorial in the capital city of Yerevan, the twin pillars of religion and language have stood in defence of national identity. Perched, austerely beautiful, on crags and on lake shores, protected from mass incursions by the inaccessible terrain, the country’s remote monasteries and churches became the repository of Armenian art and culture, and remain the most compelling reason to visit Armenia. The story began at Khor Virap, where St Gregory the Illuminator, who arrived in Armenia to preach Christianity, was imprisoned on the orders of the pagan King Trdat III. Trdat – who, according to legend, was transmogrified into a pig for his sins – eventually saw the light, regained human form, and founded the Church of Holy Echmiadzin on the site indicated by St Gregory. 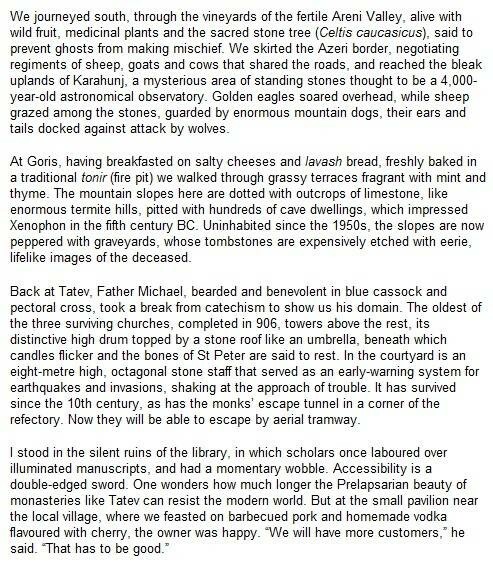 Though legend may have injected a note of porcine whimsy into the dusty reaches of ecclesiastical history, the seventh-century monastery of Khor Virap now stands above the pit where Gregory languished for 13 years. It is a popular postcard, the church framed against the snowy backdrop of Mount Ararat, where the Ark came to rest, with a foreground of vines purportedly planted by Noah himself. Ararat, the supreme symbol of Armenia, now lies across the border in Turkey, the gift of Lenin to Ataturk in 1921. I first went to Armenia in the 1990s, in the early years of independence, after earthquake and war with Azerbaijan had devastated the economy. A combination of fuel shortages and atrocious infrastructure made it impracticable to venture far beyond the capital’s hinterland. Today, however, good roads make their way into dizzyingly remote reaches, encouraging a nascent tourism industry. 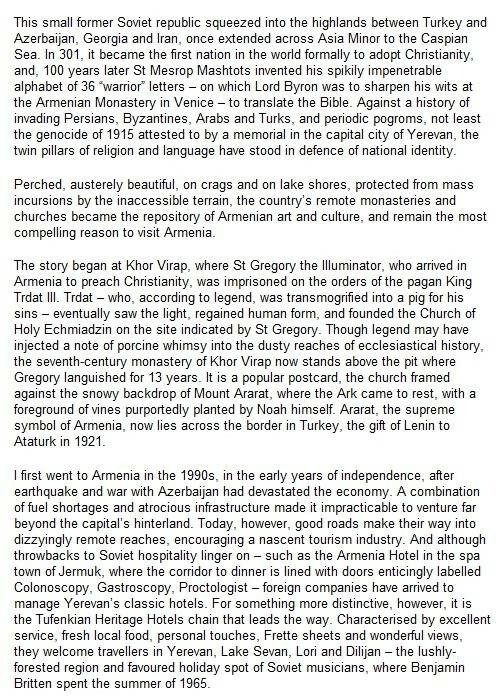 And although throwbacks to Soviet hospitality linger on – such as the Armenia Hotel in the spa town of Jermuk, where the corridor to dinner is lined with doors enticingly labelled Colonoscopy, Gastroscopy, Proctologist – foreign companies have arrived to manage Yerevan’s classic hotels. For something more distinctive, however, it is the Tufenkian Heritage Hotels chain that leads the way. Characterised by excellent service, fresh local food, personal touches, Frette sheets and wonderful views, they welcome travellers in Yerevan, Lake Sevan, Lori and Dilijan – the lushly-forested region and favoured holiday spot of Soviet musicians, where Benjamin Britten spent the summer of 1965. A map of ArmeniaWithin striking distance of Yerevan is Geghard, one of the most astonishing among the dozens of noteworthy monasteries: a complex of three interconnected cave churches, dating from the 4th to the 13th centuries, hewn from the massive basalt rock. Somewhere, someone intones the Patarag – the Orthodox liturgy – and the air reverberates to its sound. Carvings of animals and mythical beasts decorate the walls. Khatchkars – the rectangular, commemorative “stone-crosses” ubiquitous in Armenia – outrival each other in intricacy of design. Outside, serenaded by the plangent duduk and zurna, the traditional woodwind instruments of local pipers, we purchased provisions from a colourful chorus line of ladies in national costume: sojuk sausages of walnut set in grape must; apricot lavash, dried jam rolled into thin sheets; and wheels of delicious, brioche-like local bread. The women waved us off smiling, flashing gold teeth. 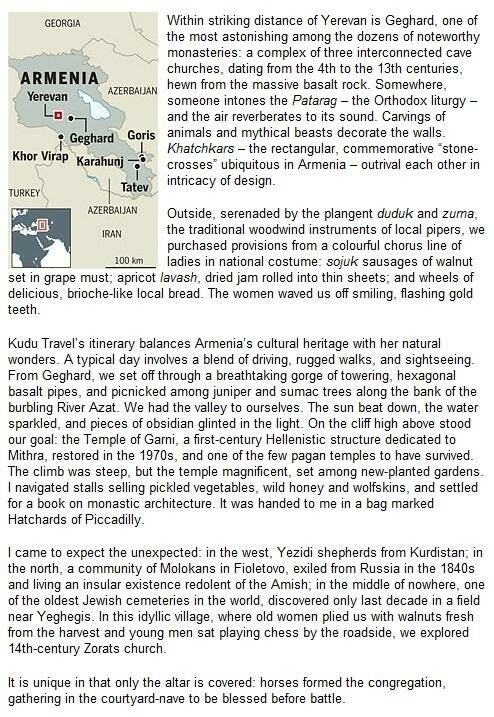 Kudu Travel’s itinerary balances Armenia’s cultural heritage with her natural wonders. A typical day involves a blend of driving, rugged walks, and sightseeing. From Geghard, we set off through a breathtaking gorge of towering, hexagonal basalt pipes, and picnicked among juniper and sumac trees along the bank of the burbling River Azat. We had the valley to ourselves. The sun beat down, the water sparkled, and pieces of obsidian glinted in the light. On the cliff high above stood our goal: the Temple of Garni, a first-century Hellenistic structure dedicated to Mithra, restored in the 1970s, and one of the few pagan temples to have survived. The climb was steep, but the temple magnificent, set among new-planted gardens. I navigated stalls selling pickled vegetables, wild honey and wolfskins, and settled for a book on monastic architecture. It was handed to me in a bag marked Hatchards of Piccadilly. I came to expect the unexpected: in the west, Yezidi shepherds from Kurdistan; in the north, a community of Molokans in Fioletovo, exiled from Russia in the 1840s and living an insular existence redolent of the Amish; in the middle of nowhere, one of the oldest Jewish cemeteries in the world, discovered only last decade in a field near Yeghegis. In this idyllic village, where old women plied us with walnuts fresh from the harvest and young men sat playing chess by the roadside, we explored 14th-century Zorats church. It is unique in that only the altar is covered: horses formed the congregation, gathering in the courtyard-nave to be blessed before battle. We journeyed south, through the vineyards of the fertile Areni Valley, alive with wild fruit, medicinal plants and the sacred stone tree (Celtis caucasicus), said to prevent ghosts from making mischief. We skirted the Azeri border, negotiating regiments of sheep, goats and cows that shared the roads, and reached the bleak uplands of Karahunj, a mysterious area of standing stones thought to be a 4,000-year-old astronomical observatory. Golden eagles soared overhead, while sheep grazed among the stones, guarded by enormous mountain dogs, their ears and tails docked against attack by wolves. At Goris, having breakfasted on salty cheeses and lavash bread, freshly baked in a traditional tonir (fire pit) we walked through grassy terraces fragrant with mint and thyme. The mountain slopes here are dotted with outcrops of limestone, like enormous termite hills, pitted with hundreds of cave dwellings, which impressed Xenophon in the fifth century BC. Uninhabited since the 1950s, the slopes are now peppered with graveyards, whose tombstones are expensively etched with eerie, lifelike images of the deceased. Back at Tatev, Father Michael, bearded and benevolent in blue cassock and pectoral cross, took a break from catechism to show us his domain. The oldest of the three surviving churches, completed in 906, towers above the rest, its distinctive high drum topped by a stone roof like an umbrella, beneath which candles flicker and the bones of St Peter are said to rest. In the courtyard is an eight-metre high, octagonal stone staff that served as an early-warning system for earthquakes and invasions, shaking at the approach of trouble. It has survived since the 10th century, as has the monks’ escape tunnel in a corner of the refectory. Now they will be able to escape by aerial tramway.